Today was National Doll Day. This was news to me. I've never heard of National Doll Day until today. But it does make it fitting that there are lots of dolls in today's post. Toys R Us is a thing of the past now. When my kids were little just about every one of their birthday celebrations involved a trip to Toys R Us to pick out a present of their own choice,(in addition to what we had picked out for them.) As they got older we took fewer and fewer trips to Toys R Us. My youngest is 18 now, so I hadn't visited Toys R Us much in the last few years. But I was sorry to see Toys R Us go. Like the doll show's decline, it's a shame, because it's so nice to be able to see something in person and even handle it,before buying. Sometimes you don't even realize how much you like something until you see it in person. For kids, there's nothing like walking into a toy store. It still has to be more exciting than ordering off a computer. We visited a few Toys R Us as they were on their way out. There were some things I hoped to catch when they were marked down,like the Journey Girls,which were pretty much gone by the time there was a decent discount. Then there were some other things which,like I said above, I didn't know I wanted until I saw them in the store. Here are my buys. Ivy and I had seen an Edna doll, from the new Incredibles movie, at Target a week or so before and we loved it. When we saw this one at Toys R Us we gave in to the cheap price and brought her home. 'Over 55 sayings'? I keep getting the same ones. 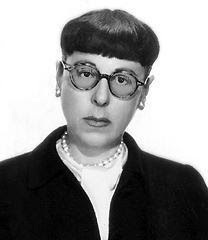 For those of you who don't know, 'Edna' is based on Oscar winning costume designer Edith Head. 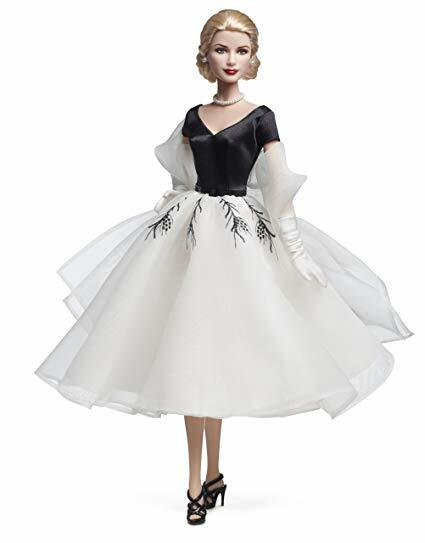 Edith Head designed costumes for movies such as Rear Window,for which she designed the Grace Kelly dress that was copied for the doll made in 2011. Boy. Sometimes my posts stray to some unconnected places,don't they? I found these little guys. I had never heard of Floogals before.I just thought they were cute. I definitely would have had them when I was a kid. Ivy even succumbed to a plush one,the character with freckles. I had also never heard of Knolly Nibbles,but is this not the cutest character you're ever seen? I was hoping to catch a Kuu Kuu Hara Juku doll on a good discount.but all they had were huge sets,and outfits. I nabbed a couple of outfits,and hopefully I'll come across a doll at a thrift store at some point. They had several of the outfits at some of the stores we went to,but I just got my two favourites. They had Supergirl and Batgirl. I wasn't too keen on Supergirl, but I like Batgirl. One Toys R Us we visited had a few of this guy. I like him, but then I noticed he has molded on gloves. That puts me off a bit. When my kids were little we loved watching Hey Arnold on Nickelodeon. It was one of the best cartoons of the era. I related to the character of Helga. These days the toys take me back to my kids' childhoods. There were very few Hey Arnold toys made back then. There was a variety of them at Toys R Us during the closing though. I got these Arnold and Helga plush dolls. They had Gerald too, but he looked weird. I got this Arnold bobblehead. I also got these 2 small Hey Arnold blind box figures.I got Arnold and Phoebe. Surprisingly, they still had these Marvel Fan Girl dolls at a pretty big discount. I love this one. She's the prettiest one in the line I think. And she has the coolest outfit. There was also this one. She's ok, but I don't like her lips much. There was one doll that was at every Toys R Us we visited,and in large quantities. I don't know why,because I thought she was very pretty. There were three dolls in the series, and one of the stores we went to had all three. I had decided to get Becky,but Emma almost had me talked into getting Eva,the one with fire engine red hair. At the last moment I went back to the orange haired Becky though. Her outfit is kind of interesting,but I think something else would show her off to her best advantage. Her clothes are printed. It's almost like she's a cartoon. There are lots of gears all over her stretchy pants. Her boots are open at the back so they're easier to slide on and off. She's jointed at the neck,shoulders, elbows,wrists,hips, and knees. Her arms can move out to the sides, but her legs aren't very posable other than the bendable knees. So I decided to find something to redress her in that would show just how pretty she is. All I could find that even partially suited what I had in mind was a vintage scarf. I tried to make her look a bit like a goddess or something. Hey, don't judge me. Much better than the steampunk wrestling outfit at least? So goodbye Toys R Us. I have heard Kaybee Toys is going to be making a comeback, taking over from Toys R Us. We used to go to Kaybee a lot more often than Toys R Us since there was a Kaybee here in town,and Toys R Us was an hour or so away. Kaybee was much smaller though. Toys R Us was the big boy,and that will be missed. You got some great stuff! I’m super-jealous you got Black Panther, she’s the best looking one of the series, imo. I have heard that like Iron Man, her skin tone is just painted on, though! Idk why they did it like that. She is! I was really surprised he was still there at a fairly big discount,and in quantity too. I haven't deboxed her, but she doesn't look like she's painted. I hope not. That's a really bad idea. The repro Mrs. Beasley had a painted face, and every little ding or scuff showed up as a shine mark or worse. Love your haul. Love the orange haired doll, and especially her are an punk tights. As you may have guessed from the extra attention she got, I think she's my favourite too. "are an" was meant to be "steam." Autocorrect acts up sometimes. We have all experienced that! Our Toys R Us is still open and when we last visited about a month or so ago, there didn't seem to be any less stock....and no bargains yet to be had...except for some Journey Girl outfit sets, they were half price but still expensive. I will go again soon and see what, if anything, is happening in the store. Is your Toys R Us going out of business at all? I heard that some of the ones in Canada and other places were not closing right now.